Welcome to my first book review! I hope you find it informative – if you have any feedback, feel free to leave a comment below. Haafner Linssen is a Dutch crochet blogger (byhaafner.blogspot.co.uk – no update since December 2016 though) also active on Instagram (byhaafner). 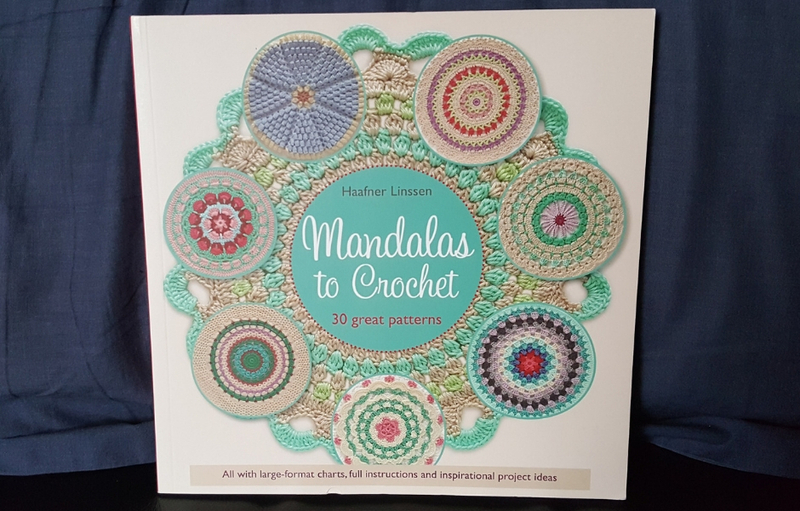 Her book Mandalas to Crochet was published in 2016 by Search Press, “The leading supplier of arts & crafts books in the UK” (as they say so themselves). This book presents different circular crochet motifs, mostly worked in the round (from the centre outwards), with only a couple of exceptions. It starts with an “about the book” page, which shows and explains the different sections of the book and how to use them, as well as a presentation of the author and a definition of what a mandala is. An explanation of how the charts are presented is given: after the first few rounds, only a segment of the mandala is shown in colour (to avoid getting lost while working a specific round – but also to save printing space and avoid having to reduce the size of the graphs too much! ), but most of the outline of the mandala remains shown in grey to give a feel of the overall shape – very clever! I was impressed by the useful section about yarn choices, with a 6-round sample mandala worked in different yarns (all in neutral colours), from superfine crochet thread to different types of DK (in acrylic and plant fibres – however not in wool or any other animal fibre as Haafner is vegan), to t-shirt yarn and jute rope (my favourite!). It is a real invitation to play and experiment with materials and hook sizes. The use of colour is also addressed; I found this most welcome, as I am not very good at colour coordinating yarns. On this double page, the illustrated mandalas are worked in the same yarn quality but in different colour combinations AND colour plans (how many rows per colour, colour changes and repetitions, etc.). It is, once again, an open invitation to discover the various effects created by different colour schemes and to experiment. More non-prescriptive information pages follow, with two options to start the mandalas and a mention of the use of standing stitches and invisible joins to open and close rounds for crocheters ready to move on from the standard chains and slip stitches. Tips for problem-solving and a “crochet refresher course” are also provided (extra info on stitches and their abbreviations are also given at the end of the book). You can either flip through the pages of the book to find a tempting mandala to make or use the “mandala selector” pages, which contain pictures of the actual mandalas for which the patterns are provided, mostly in muted colours, with a page reference to find the corresponding pattern. Each mandala pattern is presented on a double page spread, with its title, its chart and its written instructions, as well as a large picture of the worked mandala on backgrounds made of different white vintage linens, which I find brings out the colours while conveying an extra feeling of calm and contentment. I love that there is a key next to each chart (no need to flip back and forth to consult a master key) and also that for every pattern Haafner spells out the starting number of stitches and reminds us of the simple mathematical principle applicable to any round, flat crochet piece, which is that this number is also the number of increases necessary in every single round of the pattern. The hook size suggested for all but one of the 30 mandala patterns is a 3 or a 3.5 millimetre hook and a diameter is given for all the finished pieces when worked with the recommended hook. Of course, as everyone’s tension is different, you might not get this exact measurement, but at least it gives you an idea of the minimum size you might get should you decide to use a thicker yarn with a larger hook. Some mandalas are made of plain, standard stitches, while others offer a mix and match of front and back loop stitches or an opportunity to play with front post and back post stitches. Some are made from a single type of stitch throughout, whereas others offer some daring combinations featuring popcorns, clusters and loop stitches. The 30 mandala patterns are followed by a couple of double pages of suggested borders that could be added to the mandalas and which are presented in soothing tones of ecru and metallic grey. Mandalas are pretty and enticing, but what can they actually be used for? Haafner has the answer with a few projects like a bag, a hot pad, a table mat, even a summer scarf, a couple of blankets and of course, for fans of super chunky t-shirt yarn, a rug! I don’t think this book can be used by complete beginners as a learning tool, in spite of the crochet refresher course that precedes the mandala patterns. However, it is perfectly suitable for rusty crocheters or beginners who are ready to make a little jump towards a lower-intermediate level – as long as they make sure to read ALL the instructions of the “Read this first!” section. The selection of stitch designs is generous and varied. Once you have found your favourite, you could just do it over and over again, using different colour combinations! Overall it is a very pleasant book to own. As I work mainly with graphs and tend to ignore written instructions, I cannot guarantee that my copy is 100% error-free but I have checked the keys of all 30 mandala charts and everything seems to be correct (which I was relatively surprised about, given what I have seen in other publications, and especially as Haafner originally writes her patterns in American English). Mandalas to Crochet is a very well presented, clear, cheerful and subtly colourful book, and flipping through its pages is surprisingly calming (which is a side effect I was NOT expecting!). If mandalas are your thing, I thoroughly recommend it.